A brief note on a lovely omelettey dish. Saute green beans and green onions with sesame oil. Add beaten eggs on the top and let ’em cook till golden! Pour yummy sauce on the top. This was a meal from ages ago…just now getting around to writing it up. The central ingredient is okara, which resulted from the Great Tofu-Making Adventure. 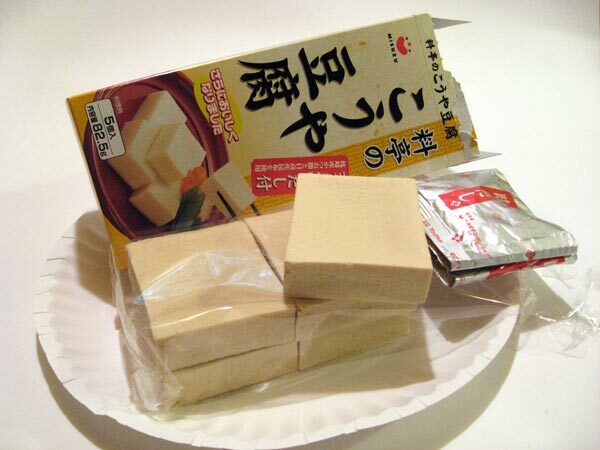 Okara or “soy pulp” is often referred to as a tofu by-product. But the description is misleading. It’s the fluffy soy beans stuff that is separated from the soy milk (which actually becomes the tofu). Japanese tofu shops often give it away by the bag or sell it for the equivalent of a few cents. It can be used in a variety of dishes, eaten on its own or used to add texture to other foods. It’s super-proteinious, plus calcium, iron, and riboflavin. Oh, boy. To me, it’s somewhat reminiscent of quinoa, but softer and fluffier, with a vaguely grainy texture. He cooked the okara in a dry frying pan for 5-10 minutes to reduce the water content and then set it aside. He cooked the veggies in this mixture until slightly soft. Finally, he add the okara and simmered everything until it was fairly dry (not soupy). More okara ideas and information can be found from the lovely Just Hungry. She uses it in bread recipes, pasta sauce, stir fries, polenta, and even a tuna sandwich! The comments on the post have even more ideas. Yusuke began this stir fry by dicing sweet potatoes and then microwaving them for 3 minutes. Next, he sautéed green beans in a tiny bit of canola oil in the frying pan. When tender, he added the sweet potatoes, cubed firm tofu, and crimini mushrooms, along with sea salt, black pepper, and 1 tsp of chicken seasoning powder (used for Chinese cuisine). He mixed everything together and added a bit of garlic for good measure.